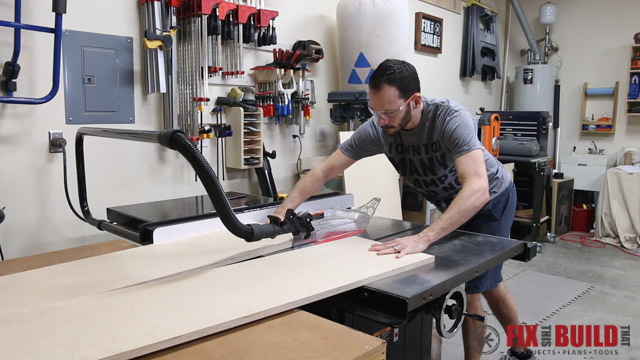 What’s up guys, today I’m going to show you how to build a clamp rack. 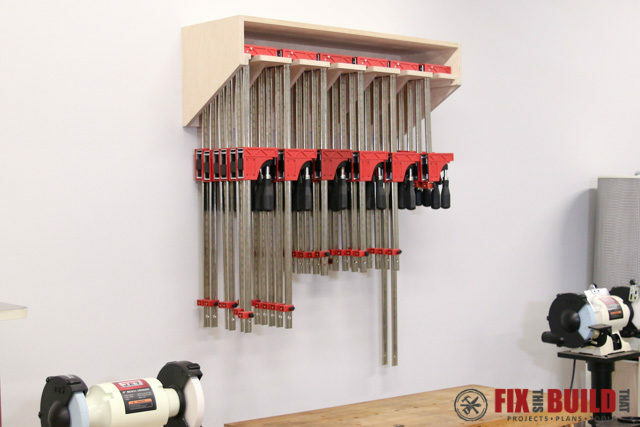 This clamp storage unit will hold up to 36 parallel clamps or a whole mess of bar, pipe or other clamps. 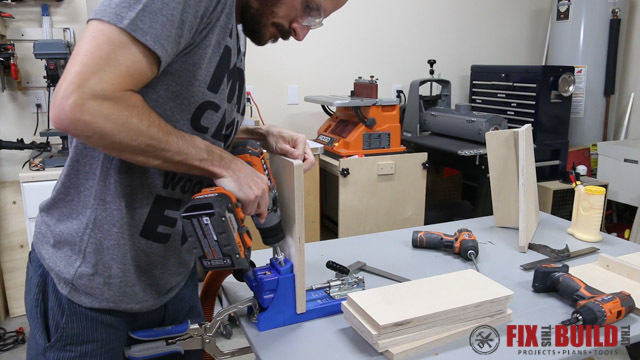 Wait, who the heck has 36 parallel clamps??? 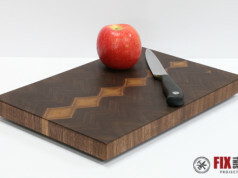 JET Woodworking, that’s who! I partnered up with JET Woodworking to make this clamp rack for their training facility which is just about a half hour from my house. The clamp rack is based on my Space Saving Parallel Clamp Rack I made last year and have in my shop. 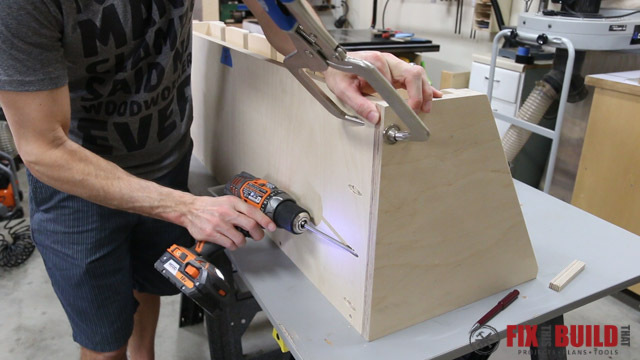 It can be modified to hold other types of long clamps (bar, pipe, squeeze, etc.) 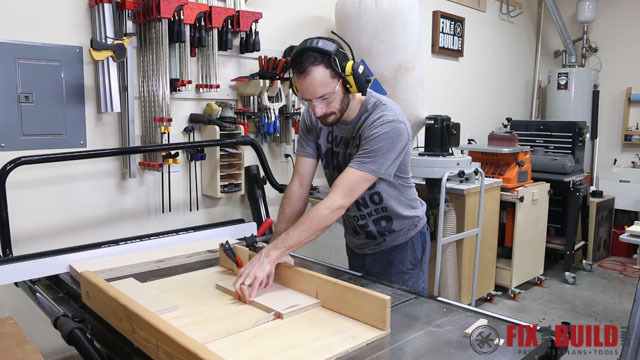 along with your parallel clamps. I’ll show you how I built it and if you want to build your own version I have plans available. You’ll get both this version and the previous version plans to look at so you can decide what works best for you! 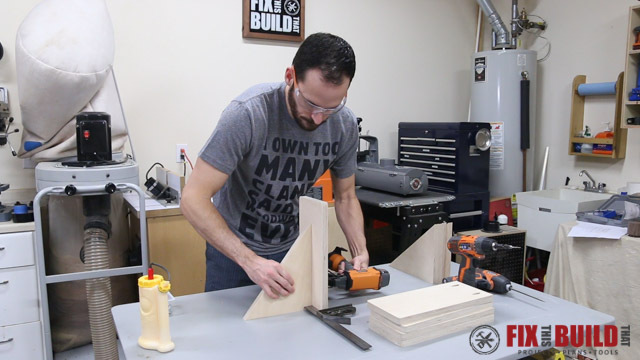 Before we get started, make sure to follow me on YouTube and Instagram to keep up with all my latest builds and free projects! 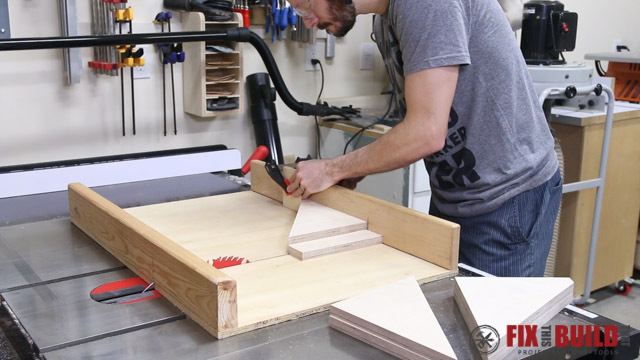 The whole clamp rack can be made from a half sheet of 3/4″ plywood. To get all the pieces out of the half sheet I had to be pretty precise with the layout and cutting everything in the right order is really important. 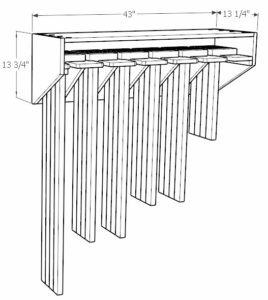 You can buy the plans for this clamp rack with a parts diagram and cut list included by going to the plan page. I cut two long strips off for the top and the back. 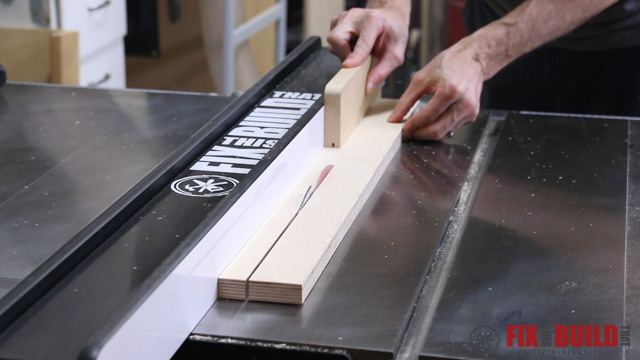 Then I used my crosscut sled to cut the parts to length . The offcuts from these pieces will be used for clamp supports later. 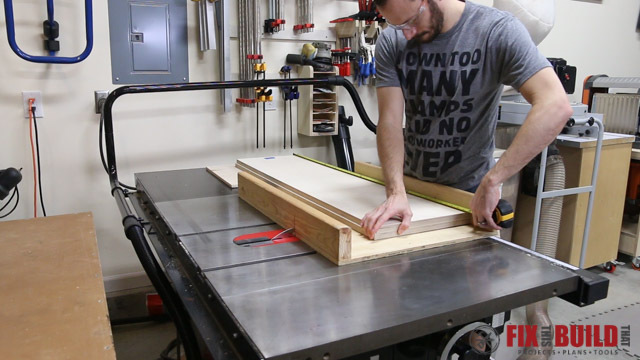 I cut a piece off of the bottom of the remaining plywood for the sides of the rack. I cut it to width but left it a little long for the next step. 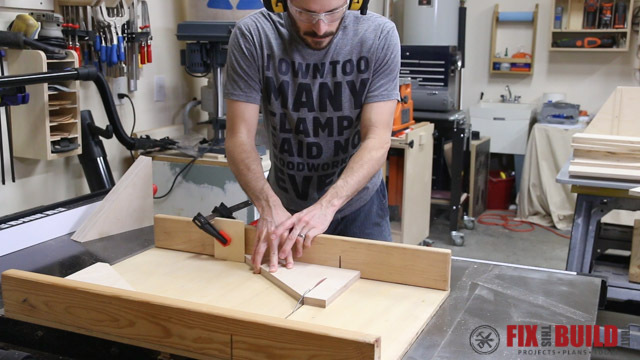 To get the two sides, I laid out an angle across the piece to establish one of the parts then I used a t-bevel to setup the same angle between my miter gauge and the blade. 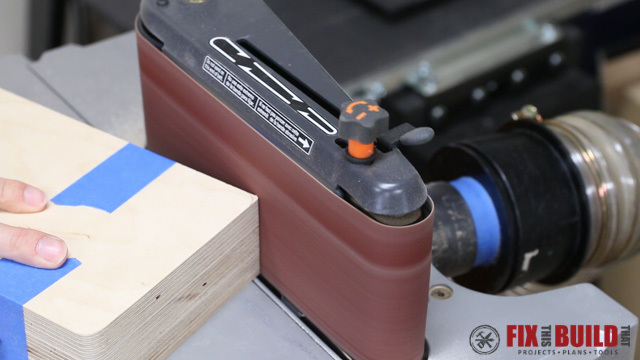 I clamped a stop block on the auxiliary fence of my miter gauge and made the first cut on the layout line. 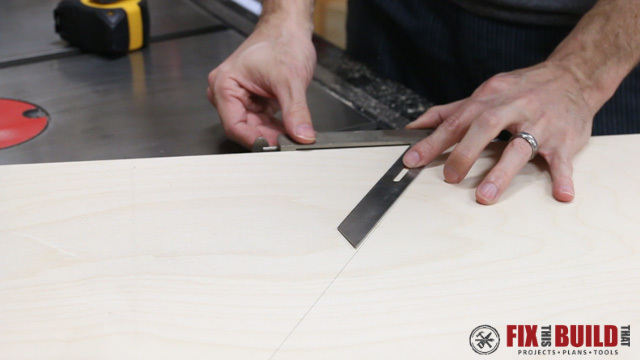 Then I registered the longer off cut against the stop block and cut the second side to size. 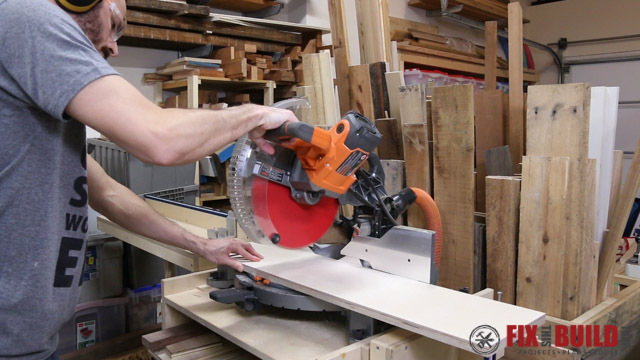 If you have limited infeed or a smaller table saw I’d recommend you make this cut with a jigsaw or bandsaw. With the sides and back cut to size I moved on to the clamp supports. I ripped a series of parts to make the horizontal supports for the clamps and a strip for two cleats. The supports on the outside of the rack will be attached to mounting cleats on the sides. I cut the cleats to size, leaving room for the back panel, then I attached one to each side. 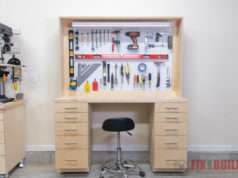 I tacked them in place with a brad nailer then secured them with 1-1/4″ screws to each side. I rounded the front corner on the sander to take off the sharp edge as well. Next I moved on to the horizontal clamp supports. I cut a small piece for the left side of the rack, 5 full width pieces for the center supports and piece for the right side slightly smaller than full width. 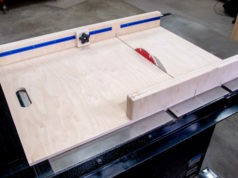 To make it easier to get the clamps in the rack I wanted to round the front corners of the supports. 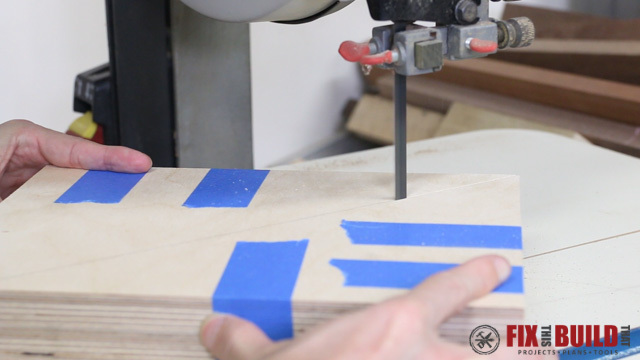 I used a ¼” washer and marked a small radius on those corners. To make the sanding a little faster I taped the inner supports together in a stack of 2 and a stack of 3 supports. 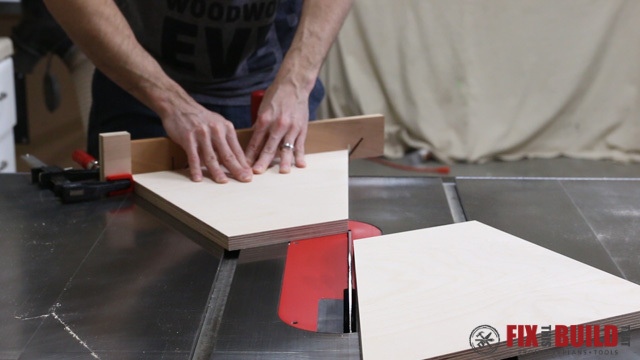 You could also round these with a palm sander or disk sander just as easily. 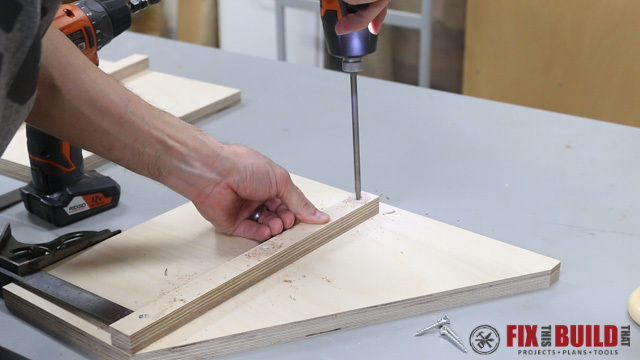 The last piece before assembly is to make the triangle brackets to hold the clamp supports. I grabbed the last piece of plywood from the half sheet and cut it into 3 sections a little longer than I needed on the miter saw. I laid out the size triangle I wanted on the top piece and then taped all 3 pieces together. 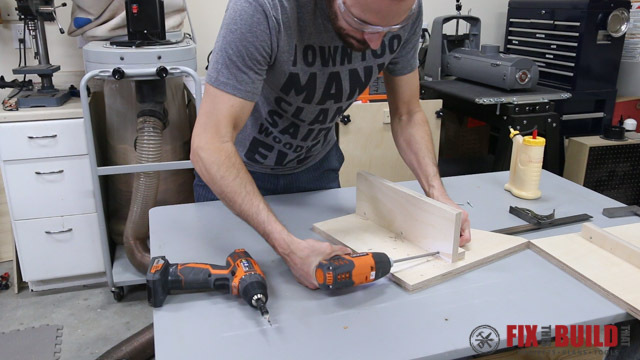 The parts were too small to comfortably cut on the tablesaw so I cut them on the bandsaw. I added a little more tape to keep each stack together then sanded the rough cut edges smooth on the sander. I was left with one stack of 3 8” by 10” triangle brackets and a stack with 3 oversized ones. 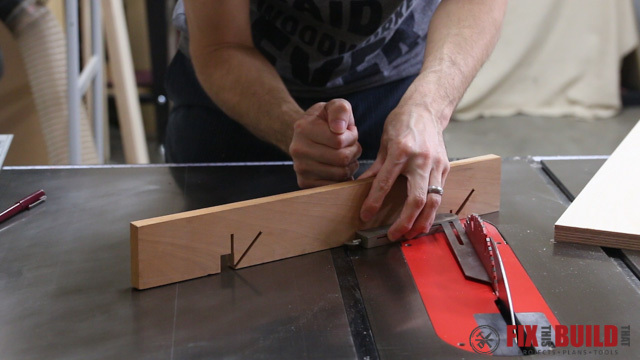 Using one of the good brackets as reference, I set a stop block on my cross cut sled and cut the other 3 to size. This left me with one extra in case I need it later. Next I put together the clamp support assemblies. I started by attaching the left and right edge supports to the sides. I used glue and 3 screws per support just like the cleats. To prep the inner supports I drilled pocket holes on the top side of each one then I marked the location for 3 screws down the center of each of them. To assemble the inner supports I put glue on the long edge of a triangle bracket then centered it on the horizontal support. I used a combination square to center bracket and a right angle on the other side of the bracket to make sure it was standing up straight. I tacked the pieces in place with a brad nailer then secured them by predrilling and screwing the horizontal support down in the locations I marked earlier. I repeated this 4 more times and had all my inner supports ready. Assembly is pretty straight forward. 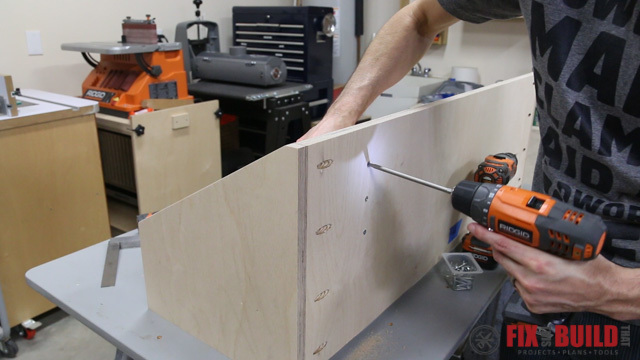 I started by attaching the sides to the back with pocket screws. I shimmed the back up off the table with a few scraps to leave room from the top. I flipped the assembly on it’s back then brought over the inner supports. I laid the top up against the outer supports to set a level reference for the inner supports and clamped it in place. 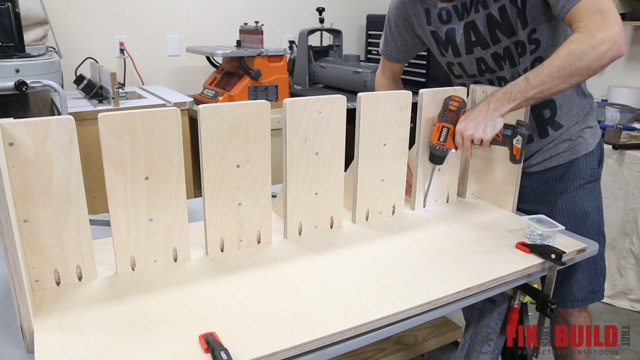 To get consistent spacing between the supports I cut 6 little spacer blocks to size. I had to do a little finagling to get them just right but it worked out well. 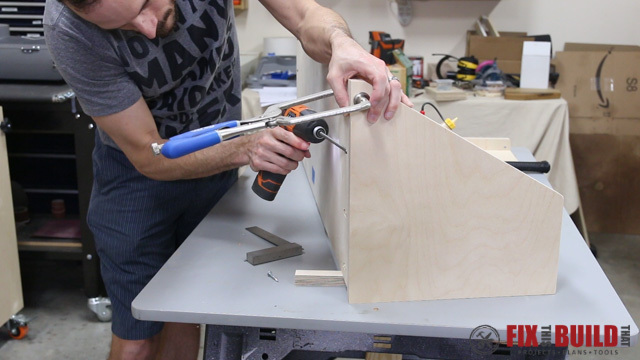 To attach the supports I put glue on the back of each one then aligned the support with the spacer block and the top and secured them with pocket screws. These parallel clamps are pretty heavy so I wanted to put 3 screws in from the back into each triangular bracket. I flipped the rack over and used a combination square to mark for 3 screws on the center of each bracket. I tried to move quickly here so the glue wouldn’t start setting up before I could get the screws in. 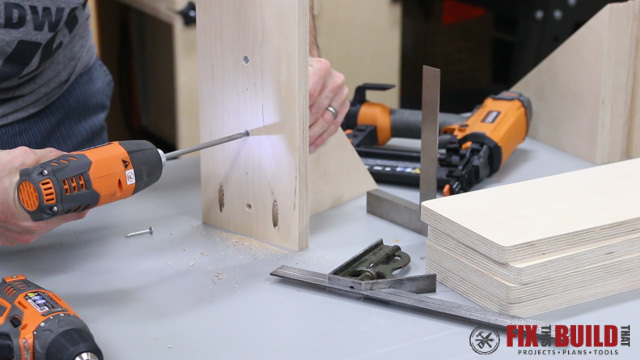 After the brackets were marked I predrilled and drove 1-1/4″ screws in for each bracket. With the supports in place the last thing to do was attach the top. I slid it into place then predrilled and attached screws into the back. Then I clamped the top flush with the sides a right angle and secured the top to each side with pocket screws. The rack was done and I took it over to the JET and Powermatic Training Facility to hang it up and get its new clamps put in it. 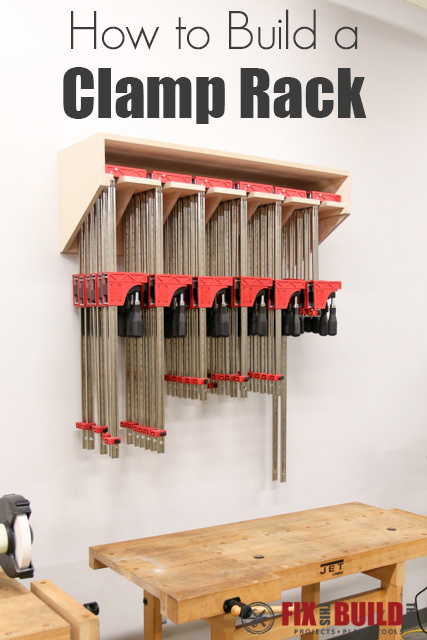 There is a link below to plans for how to build this clamp rack and it will also include plans for the smaller version of this I built for my own shop to hold other types of clamps. If you want to see more shop builds head over to my Shop Projects page! JPW Industries provided me with product and/or monetary compensation as a sponsor of this build. All opinions are my own and are not filtered by the sponsor.